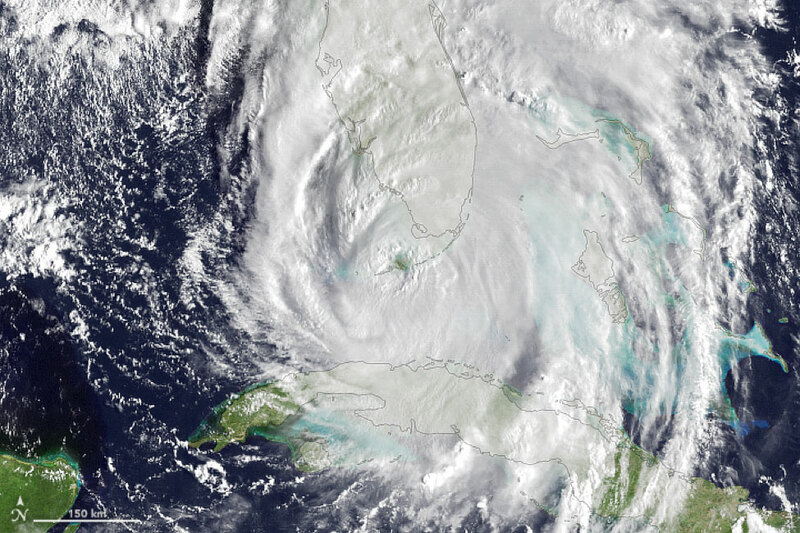 Hurricane Irma making landfall in the Florida Keys as seen by NASA’s GOES-13 satellite on September 10, 2017. Hurricane Irma impacted the Gulf coast of Florida, as well as the Southeast Atlantic coastlines of Florida, Georgia and South Carolina from September 10–11, 2017. Preliminary observations from tide gauges along the coast indicate storm surge reached 1 to 2.5 meters above predicted tides. Offshore wave heights in excess of 6 meters were observed on both Gulf and Atlantic coasts of Florida. These large waves contributed to an additional 1 to 5 meters of wave runup at the shoreline. The combined effects of surge and storm-induced wave runup created elevated total water levels at the shoreline, causing extensive erosion of the beach and dunes.